The bridge club is closed after December 12th 2018, until February 6 2019. Come try your hand at a game of Bridge! We would welcome new persons who would like to join our club. If you have not played bridge before and wish to learn I would recommend taking bridge lessons first. There are classes at the Churchill Centre near our neighbourhood on Richmond Road at Churchill. 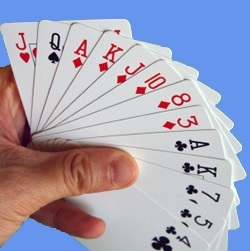 If you have played contract bridge but feel you are a bit rusty come and try it out. We would also welcome players who could act as spares when our numbers are awkward. We would gladly welcome new members in the winter when a few of our members go south. A small friendly group meets at the Champlain Park Fieldhouse on Wednesday afternoons at 2:00 p.m. to play regular contract bridge. While we do attempt to play well, we are not a duplicate group, where one is strictly business and silent. We enjoy conversation as well as bridge, tea or coffee and cookies as well. So do not be shy, do not worry that your bridge is rusty! We will help you get back into form. For more accomplished players, bridge is always a challenge and learning or teaching new bidding methods is also worthwhile. The Champlain Park Fieldhouse is on Cowley Avenue just north of Clearview. It is the only building in Champlain Park.